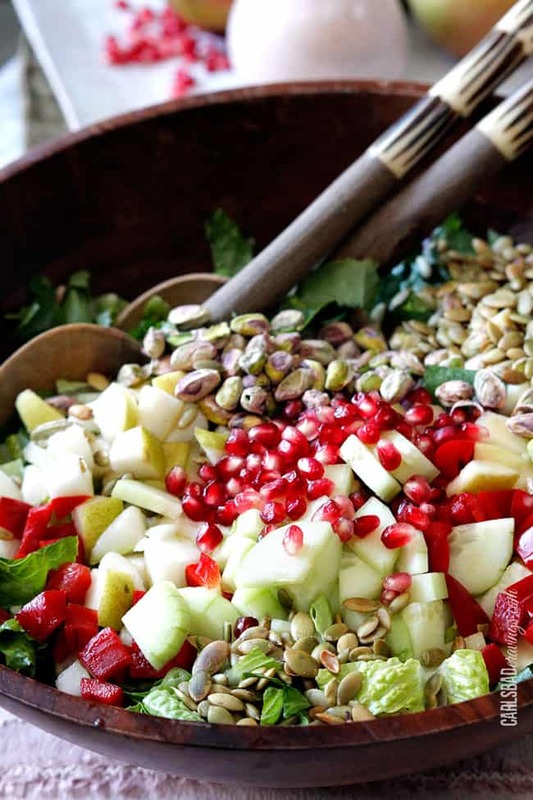 Pear Salad is SO addictingly delicious bursting with pears, pomegranate seeds, apples, cucumbers, peppers and creamy feta complimented by salty roasted pistachios and pepitas all doused in Creamy Pomegranate Dressing! Pear Salad is the perfect showstopping salad for Thanksgiving or just plain delicious for everyday! This Pear Salad is a healthy Fall inspired salad, packed with flavor and texture in every sweet, crunchy bite. 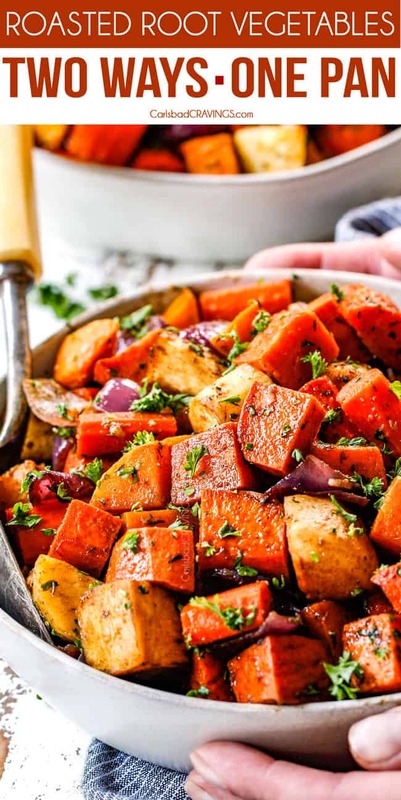 It’s the kind of salad that looks impressive, tastes gourmet but is easy to throw together, making it perfect for all your holiday gatherings. For this Pear Salad, I prefer Bartlets or Bosc pears, (I used Bartletts this time), but it really comes down to personal preference. How Can I tell if My Pear is Ripe? We want to use a pear that is ripe for maximum sweetness but not overly ripe to the point it is soft and will get mushy. Ripe pears should yield slightly when pressed – much like an avocado or mango. If your pears are ripening quicker than you would like, then place it in the refrigerator to delay the process. If you find yourself ready to make this Pear Salad in a couple days but your pear is still rock hard, you can speed up the ripening process by placing it in a paper bag with your apple at room temperature. If you happen to have a banana, then throw it in the bag too for even quicker ripening. The star of this Pear Salad is the juicy pear slices, so we want to keep them looking beautiful! My favorite way to keep pears and apples from oxidizing and turning brown after slicing is to put them in a bowl of apple juice. This way they don’t become bitter like soaking in lemon juice can do. If you only have lemon juice on hand, then mix 1/2 cup water and 2 tablespoons lemon and then toss your pears in the mixture. Can I Use Different Nut? Absolutely! You can swap the pistachios for pecans, walnuts or almonds. You can even use Caramelized Nuts. I love the salty, creamy tang of feta cheese but goat cheese or Gorgonzola would also be fabulous. For this Pear Salad, I wanted to create a a bright, creamy dressing that would compliment the crisp, crunchy textures. 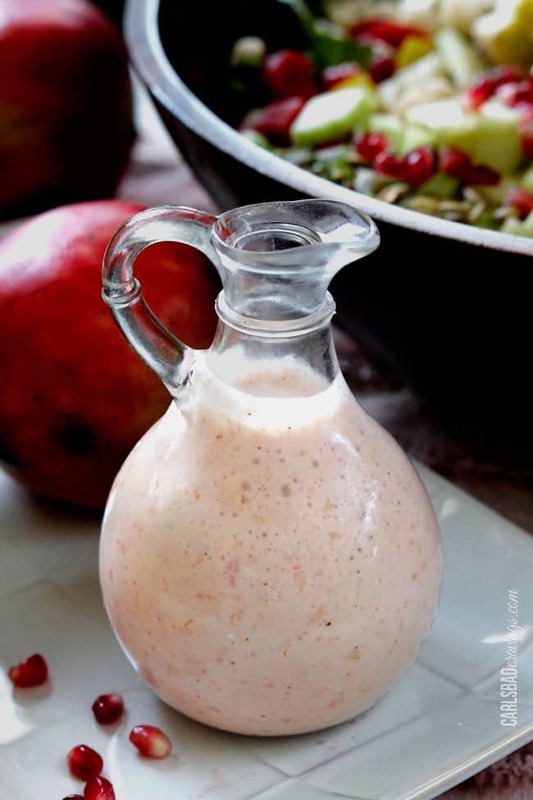 I went with a Creamy Pomegranate Dressing and it is heavenly! The delectable dressing is comprised of Cherry Pomegranate Greek Yogurt (I buy the small single serving for this), pomegranate juice, apple cider vinegar, lemon juice and Asian Sweet Chili Sauce (found in the Asian section of your grocery store). The Asian Sweet Chili Sauce is my go ingredient to in every sauce and dressing – it sweet, and tangy with a kick. It doesn’t make the salad spicy but adds a nice flavor punch with its rice vinegar, red chilies, garlic and sugar that perfectly compliments the sweet fruit in this Pomegranate Pear Salad. 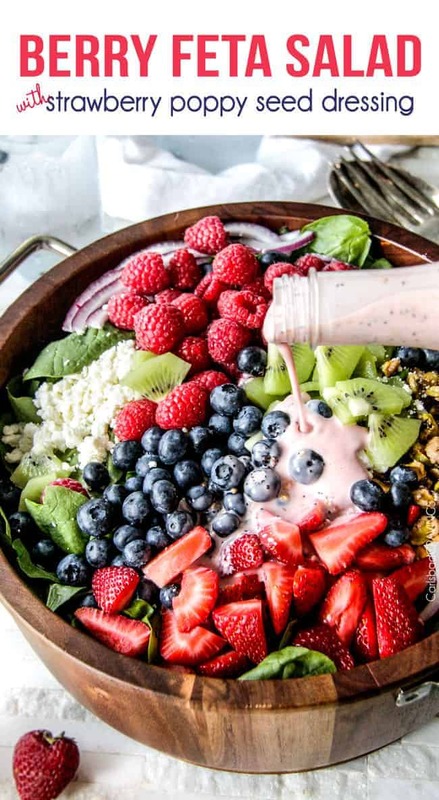 Make the Salad Dressing first so it has time to chill and the flavors develop. Not one likes warm salad dressing! You can make the dressing sweeter by adding more sugar or tangier by adding more vinegar according to your personal taste. Slice the pears and apples just before serving and either place in apple juice or a water/lemon juice bath. 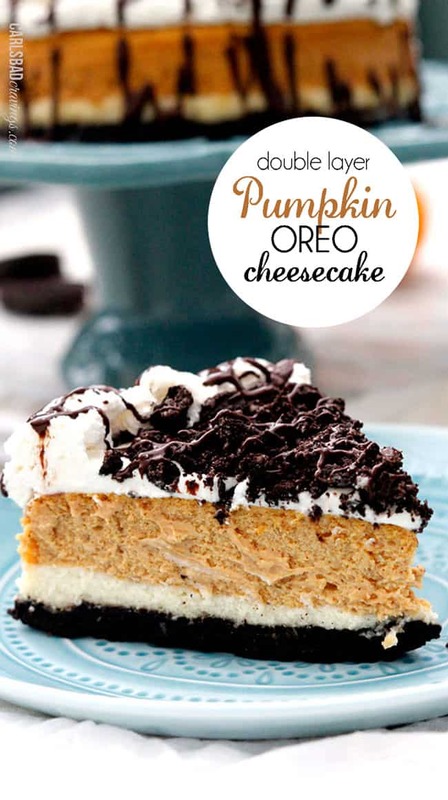 You can replace the pepitas with sunflower seeds if you can’t find them. I get my pepitas at the bulk section at Sprouts. You can purchase a whole pomegranate and seed it yourself or you can buy just pomegranate seeds in a container. 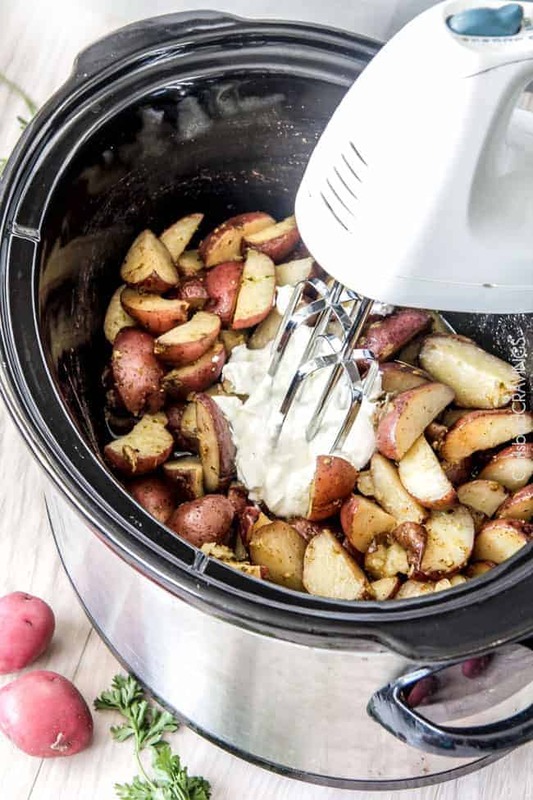 Want to try this Pear Salad Recipe? 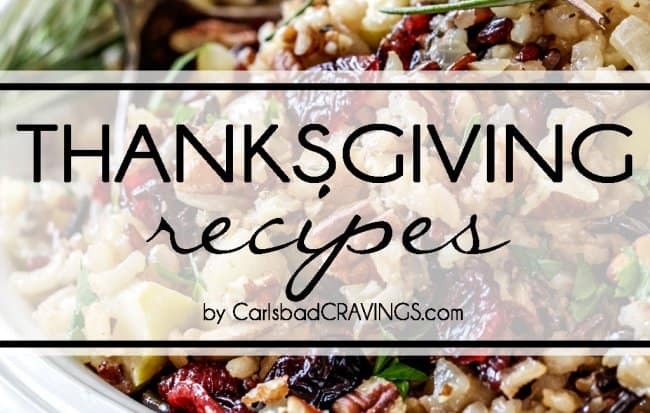 Pin it to your SALAD, THANKSGIVING or HEALTHY BOARD to SAVE for later! 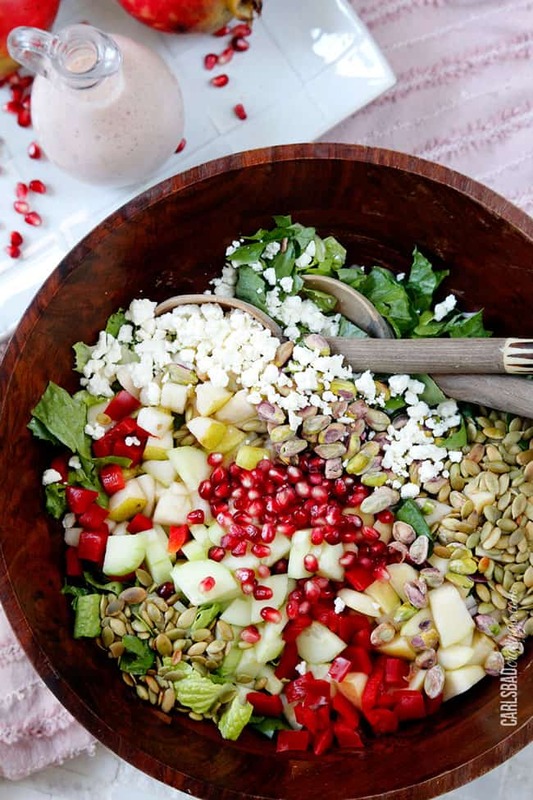 Pomegranate Pear Salad is SO addictingly delicious bursting with sweet pomegranate arils, pears, apples, cucumbers, peppers and creamy feta complimented by salty roasted pistachios and pepitas all doused in Creamy Pomegranate Dressing! 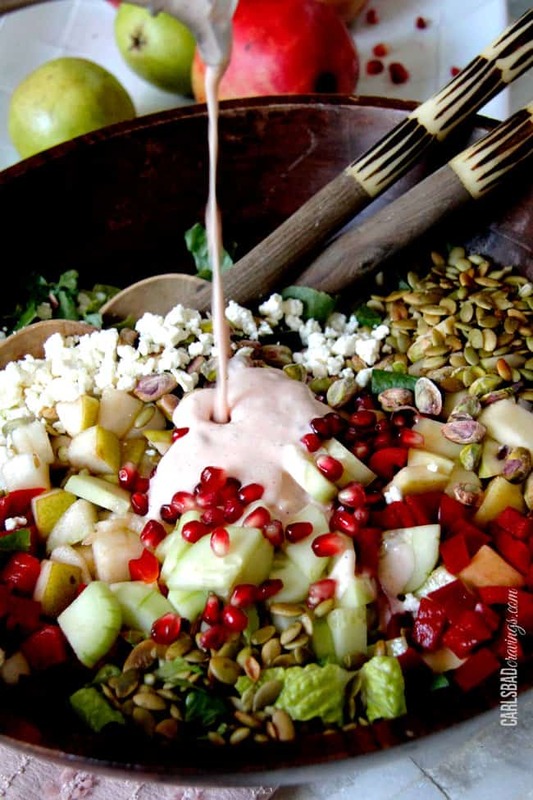 Whisk together all of the Creamy Pomegranate Dressing ingredients in a medium bowl and chill in the refrigerator while you prepare the salad. 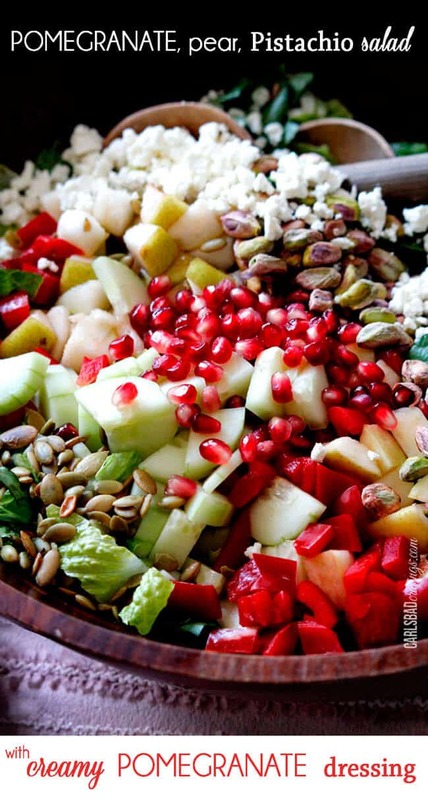 Combine salad ingredients in a large bowl. If serving entire salad immediately, drizzle with desired amount of dressing and toss to coat. 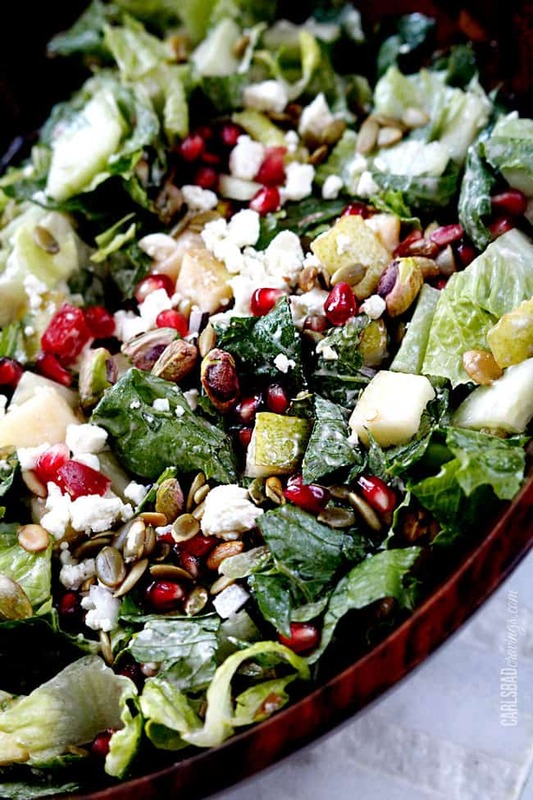 If there might be leftovers, drizzle dressing on individual salad servings. Top with freshly ground salt and pepper. Your salads are so yummy, your blog has been my go-to for salad recipes for the past week! I’ve been taking the apple walnut salad to work for lunch and my co-workers are jealous! 🙂 It’s so delicious! I’m hoping to make this one as soon as pomegranates are in season! Thank you for sharing such delicious salad recipes, my lunches are never boring anymore! Yay for no more boring salads, that is awesome Ashley! I am so happy you are loving my salads and so fun to be able to take them to lunch! Its always nice to have something to look forward to in the middle of the workday 🙂 I hope this Pomegranate salad becomes another favorite! This salad was amazingly delicious! Cannot wait to make this one again. Thanks so much for sharing! You are so welcome Tiffany, I am so happy it was such a hit, thank you!